KM Packaging Services Ltd, the UK-based pioneer of lidding solutions for aluminium trays, is celebrating its 15th anniversary of innovation in this formative area. KM Packaging revolutionised the ready meals industry with lidding film for aluminium foil trays in the late 1990s, paving the way for a new generation of cost-effective, freezable and ovenable meals which would subsequently grace dinner tables across the world. Since then KM has been the driving force behind many more class-leading innovations including high-tech anti-fog solutions and precisely laser-perforated films adapted to significantly extend the shelf-life of fresh produce. Since the inception of the Smoothwall Foil packaging concept, KM has worked closely with major suppliers of both the trays and the heat sealing machinery, to ensure that products progress technically as the needs of the food manufacturer become more sophisticated. With the increasingly short period food manufacturers have for new product launches, KM has developed the product, technical back-up and stock management systems to ensure these launches benefit from the correct KM products for the application, and with the speed required to meet tight deadlines. Most recently, KM Packaging helped an award winning, high street supermarket chain to launch an innovative new range of premium ready meals in unique coloured aluminium trays, by providing a versatile, tailor-made film lidding solution. Over three decades KM Packaging has combined its food processing knowledge and technical raw material expertise to develop a sophisticated blend of chemical polymers that help to deliver product safety, optimum functionality, improved consumer usability and superior clarity. 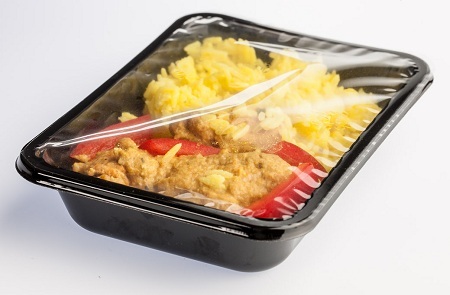 KM Packaging’s Commercial Director Graham Holding explained: “The introduction of smooth-wall lacquer-free aluminium trays really shook up the ready meal sector in the 1990s – especially once KM devised the ideal lidding solution which achieved a premium look at a less-than-premium cost. The product refinements since then may have had a smaller impact on sales but a much greater impact on waste reduction and the environment. KM Packaging is constantly investing in new technologies and flexible packaging solutions. The company’s flexibility and commitment to rapid turnaround mean that it can meet demand for both high volume orders and also fast delivery on short-run seasonal products. For more information about the company and its vast range of flexible and reliable packaging solutions, please visit the website www.kmpack.co.uk or call 01832 274944.